Two people were arrested after a Texas man reported a robbery Friday (May 27) at Koloko-Honokōhou National Historical Park. In response to 7:15 p.m. call Friday, Kona Patrol officers determined that when a 25-year-old man from Bellaire, Texas, was at the fish pond, he saw a local man rummaging through his bag. The suspect then reportedly confronted the victim, punched him in the face and fled with the victim’s cellular phone and prescription glasses. Responding officers observed a black Chevrolet Cruze parked in the area and determined that it had been stolen from a rental car company in Kailua-Kona. While the officers were at the scene, a white Chevrolet Impala approached the area and the officers attempted to stop it to speak with its occupants. The driver fled southbound on Queen Kaʻahumanu Highway. Officers determined that the Impala had been stolen from the same rental car company. On Saturday (May 28), Kona Patrol officers located the Impala in a parking lot at Kealakekua Bay in Napoʻopoʻo. 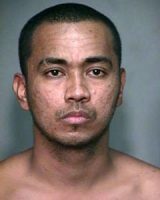 Investigation determined that 23-year-old Briana Pama of Kealakekua had been driving the Impala and that 27-year-old Justin Matias of Kailua-Kona had been her passenger. The two were arrested and taken to the Kona police cellblock while detectives from the Area II Criminal Investigations Section continued the investigation. Investigation determined that Matias was responsible for the robbery. Police recovered the victim’s cell phone and the keys to the stolen Cruze. At 9:30 a.m. Monday (May 30), detectives charged Pama with resisting arrest and two counts of unauthorized control of a propelled vehicle. Her bail was set at $4,500. She was released after posting bail. Matias was charged with robbery and two counts of unauthorized control of a propelled vehicle. His bail was set at $45,000. He remained at the cellblock until his initial court appearance on Tuesday (May 31).